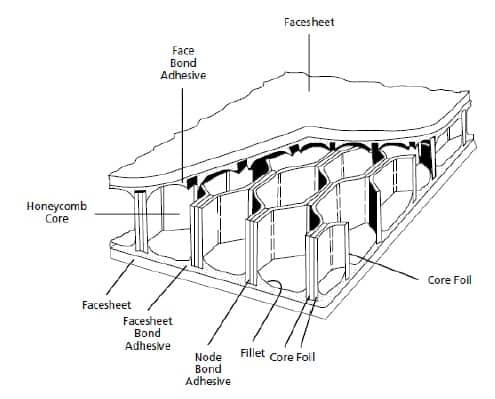 Adhesive bonding is a process of joining materials in which an adhesive (liquid or a semi solid state material) is placed between the faying surfaces of the workpiece / parts (adherents) to be joined. Either heat or pressure or both are applied to get bonding. The detailed explanation on the steps followed to get an adhesive joint is given below. The workpiece surfaces are cleaned by chemical etching or mechanical abrasion. Grinding, filing, wire brushing, sanding and abrasive blasting are some of the mechanical cleaning methods. Next the prepared surfaces are tested by their affinity to be wetted by water. It is called water-break test. Smooth spread of water is an indication that the surface is chemically clean while the collection of droplets indicates the possibility of oil film in the surface. Adhesives are applied on to the workpiece surface by hand brushing, spraying, roller casting, knife coating and dipping. They are also applied as sheet or tape type coating to the surface. The adhesive are either applied as one thick layer on one of the workpiece surface, or as a thin layer on surfaces of both the workpiece. (c) assembly of workpieces / parts and curing the joint. After the application of the adhesive, the workpieces are assembled and held together by means of clamps, tools, tack welds, or other fixtures. During the assembly process, sufficient care should be taken so that the open time of the adhesive is not exceeded, the parts are put together in the proper sequence, the bonding is performed under specified environmental conditions, and the parts are held together until cured. Curing is the process during which an adhesive changes from a liquid state to solid. The curing of the adhesive is performed with pressure and either heat or addition of suitable catalyst. The pressure should always be uniformly distributed over the entire joint. The curing temperature, time and the pressure combinations for different adherents and adhesive combinations are given elsewhere. 1. Bonding of metal to non-metals especially plastics is the major application of adhesive bonding. 2. Used as an alternative to riveting for aircraft structures. 6. Find applications in the fabrication of railway coaches, boats, refrigerators, storage tanks, and microwave reflectors for radar and space communications.